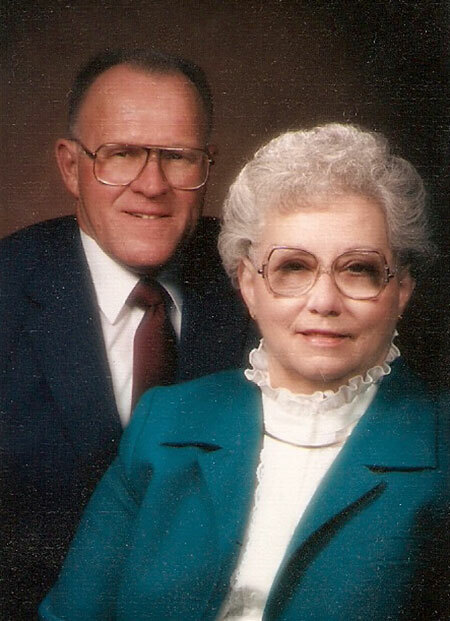 Tag Archive | "Boomer Field"
For many years, Mike and Alice Holton were generous patrons of Cedar Springs. Their gifts to the city and the public schools were instrumental in improving the facilities and capabilities each had to offer. Many of their contributions were given anonymously. Their gifts included building the pedestrian bridge over Main Street; renovating Skinner Field with new bleachers, lights, fencing, and a composite running surface track; paving the new section of the Elmwood Cemetery; key sponsors of Boomer Field; Cedar Springs Public Library projects; and the band shell used in the High School auditorium. The Cedar Springs Public School Board named Holton Drive on the school campus in honor of their generosity to the school. Mike first came to town as a kid when his father was assigned as pastor to the Cedar Springs Free Methodist Church (now The Springs). They then went to Big Rapids but his sister, Lois, stayed and later married Elwood Larson. It was in Big Rapids, according to Lois, that Mike met Alice. Alice lived across the road from the parsonage. After a tour in a US Navy Construction Battalion (SeaBee), they married and moved to Cedar Springs. Lois said the business was initially in the building where the Fast Tax Service is now and then they built another building just to the north now occupied by the Reflections by Design hair salon. It was in this environment that Mike and Alice reared their children, Kathy, Karen, Kevin, and Kris. The legacy of supporting education continues. The Holton family, in honor of their parents, decided to donate the Holton home on Northland Drive to the Cedar Springs Education Foundation so that the proceeds would go to the schools. Bill Tucker, past president of the Cedar Springs Education Foundation said, “I was contacted by Kevin Holton in late 2013. I actually met with the family in February 2014 to discuss the details of the transfer.” The deed was transferred, some needed repairs were done, and the house put up for sale. Once on the market, the house sold quickly and the Education Foundation received a net of $171, 554 after expenses. The Foundation met at a special meeting on February 4 to make that decision. After much discussion, moderated by Foundation President Jeni McIntyre, the board chose the High School auditorium sound system, for a number of reasons. Sue Spahr, board member and Middle School principal, said that the sound system would have a greater impact on both students and the community. Board members Audrey Debri and Chad Wight noted that each proposal was excellent and should be considered again at a later date. The Education Foundation and the Cedar Springs Schools greatly appreciate this gift and the Holton family’s legacy of giving.